Hedge fund managers are the smartest investors around. Insider Monkey, a source for free insider trading data, follows corporate insiders because they have access to material, nonpublic information and they sometimes trade illegally. We also follow hedge fund managers because they have the resources to research public companies extensively and have access to experts who can “guide” them. Recent insider trading scandals show the extent hedge fund managers are willing to go to get an edge over ordinary investors. We believe we are more likely to beat the market by imitating hedge funds than trading against them. 1. General Motors (NYSE:GM): Hedge funds snatched 6% of GM’s outstanding shares and amassed a $3.4 Billion position. There were 112 hedge funds with GM positions at the end of December. John Griffin’s Blue Rigde, William Ackman’s Pershing Square, George Soros, David Tepper’s Appaloosa, Roberto Mignone’s Bridger Management, Richard Perry’s Perry Capital, and Leon Cooperman’s Omega Advisors are among the several high profile hedge funds with GM (NYSE:GM) positions. 2. Citigroup (NYSE:C): Citigroup is hedge funds’ most favourite mega-cap bank. Hedge funds, 190 of them, own 8% of outstanding Citigroup (NYSE:C) shares. During the fourth quarter, they spent $2.8 Billion on Citigroup (NYSE:C) shares. Steven Mandel’s Lone Pine, Bruce Berkowitz’s Fairholme, Lee Ainslie’s Maverick Capital, George Soros, Bill Miller’s Legg Mason Capital Management, Bill Ackman’s Pershing Square, David Tepper’s Appaloosa, Daniel Loeb’s Third Point, Andreas Halvorsen’s Viking Global, Richard Perry’s Perry Capital, Joseph DiMenna’s Zweig-DiMenna, Leon Cooperman’s Omega Advisors, Brevan Howard, and John Paulson’s Paulson & Co are among the prominent investors who are bullish about Citigroup. 3. LyondellBasell (NYSE:LYB): LyondellBasell is very popular among hedge funds. Since its market cap is much smaller than giant banks or tech companies, hedge funds amassed a 13% share in LYB (NYSE:LYB). There were 99 hedge funds with LYB positions at the end of December and they spent a net $2.5 Billion on LYB during the fourth quarter. Notable hedge funds with LYB holdings are Daniel Loeb’s Third Point, Tom Steyer’s Farallon Capital, David Einhorn’s Greenlight Capital, and Andreas Halvorsen’s Viking Global are among the hedge funds with LYB (NYSE:LYB) positions. 4. 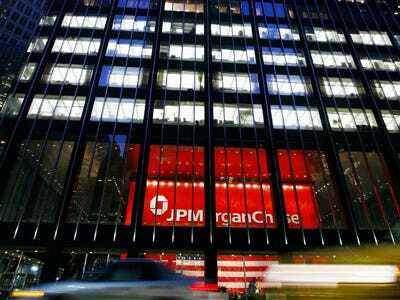 JP Morgan (NYSE:JPM): Hedge funds, 164 of them, own 4% of JPM’s outstanding shares. During the fourth quarter, they spent $1.8 Billion to place their bullish bets. Steven Mandel, John Griffin, Bill Miller, and Lee Ainslie are among the high profile hedge fund managers invested in JPM (NYSE:JPM). 5. Google (NASDAQ:GOOG): There are 164 hedge funds with a combined $6.5 Billion investment in Google (NASDAQ:GOOG). They spent $1.6 Billion during the fourth quarter. Lee Ainslie’s Maverick, Roberto Mignone’s Bridger Management, Jim Simons’ Renaissance, Andreas Halvorsen’s Viking, and Jonathan Auerbach’s Hound Partners are among the hedge funds that are bullish about Google (NASDAQ:GOOG). This post originally appeared at Wall St Cheatsheet.